Portulaca , also known by the botanical name of Portulaca oleracea , (not to be confused with Portulaca grandiflora, or with Portulacaria afra ) is considered by many, wrongly, a simple weed to be eradicated. Yet this plant is as common as it is precious, since it is a real treasure chest of precious substances for our body, such as the famous Omega 3 fatty acids and antioxidants . Portulaca oleracea is an annual succulent plant of the family of Portulacaceae that grows with the arrival of heat in the tropical, sub-tropical and temperate climate zones of the whole world, including Italy. It is a wild weed , characterized by fleshy stems, creeping and branching, reddish-brown in color and oval leaves, light green, also fleshy. With the arrival of the heat, it grows spontaneously everywhere, in gardens, in public parks, at the edge of sidewalks and streets. In our country it is known as fat grass, brucacchia, common porcelain, porcacchia, sportellecchia, pig grass, etc. 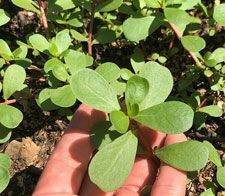 The portulaca is used in cooking especially as a fresh plant, added to soups and salads , but can also be used for the composition of other interesting recipes, such as pesto alla portulaca (see the recipe at the bottom of the article). In America and among the aborigines of Australia it is instead customary to grind the seeds of this plant to prepare a flour used for the preparation of bread. Thanks to its numerous therapeutic virtues, in addition to nutrition, portulaca is widely used in folk medicine all over the world. Let's see in more detail what these properties are and how this plant can be used. Let's start by saying that, like almost all green leafy vegetables, also portulaca is a low-calorie herb. In 100g of fresh leaves are contained only 16 calories , composed of 3% carbohydrates, 2% protein and 0.5% fat. The rest (94.5%) is water. Organic acids : linoleic acid, α-linolenic acid, oleic acid, palmitic acid, stearic acid, oxalic acid, etc. Flavonoids : hesperidin, apigenin, luteolin, quercetin, etc. Other substances : terpenes, alkaloids (dopamine, noradrenaline, etc. ), β-sitosterol, β-carotene, glutathione, proline, melatonin, etc. The fresh leaves and the stem of Portulaca oleracea contain approximately 0.50% of lipids (fats), among which a high concentration of Omega-3 fatty acids ( α-linolenic acid ), higher than any other plant, stands out vegetable leaf. Generally contained in fish and flax seeds, or hemp seeds, Omega 3 are very important because they contribute to lowering bad cholesterol (LDL and VLDL) and increasing good cholesterol (HDL), reducing triglycerides and pressure blood. Omega-3 fatty acids also have an important anti-inflammatory action that helps reduce the risk of coronary heart disease, stroke, cancer and other chronic inflammatory and autoimmune diseases [ 1 ]. Portulaca is also an excellent source of vitamin A (1320 IU / 100 g, provides 44% of RDA), one of the highest among green leafy vegetables. Vitamin A is a powerful antioxidant, essential for eye health . It is also required to keep the skin healthy .The consumption of fruit and vegetables naturally rich in vitamin A is also known to prevent the development of lung and oral cavity tumors. Portulaca is also a rich source of vitamin C (26.6mg per 100g), vitamin E (12.2mg per 100g) and some B-complex vitamins such as riboflavin, niacin, pyridoxine and carotenoids, as well as food minerals , such as iron, magnesium, calcium, potassium and manganese . Moreover, in the purslane there are two types of betaline alkaloid pigments, reddish β-cyanines and yellow β -xanthines . Both types of pigments are potent antioxidants and have been found to have antimutagenic properties in laboratory studies. [ Proc. West. Pharmacol. Soc. 45: 101-103 (2002) ]. In 100g of fresh portulaca we also find 14.8mg of glutathione [ 2 ], a natural tripeptide made up of 3 amino acids.Glutathione is one of the main protagonists of the cellular antioxidant response . Concentrated in the cytoplasm, thanks to its particular chemical structure, glutathione intervenes in maintaining the correct state of intracellular oxidation, acting as a scavenger molecule against free oxygen radicals. In addition to its strong antioxidant activity, glutathione also has detoxifying, immunomodulatory and cytoprotective properties . to improve the activity and mobility of sperm in men with fertility problems. The anti-inflammatory properties of Portulaca can also be used for the treatment of wounds, cuts, insect bites, bites, dermatitis, eczema and other skin affections . However, in this case I believe there are far more effective natural remedies, one in all the Aloe Vera gel or Aloe Arborescens . We eat everything from portulaca: leaves, flowers, stems and even seeds. It has a light lemon aftertaste and is a bit crunchy . Some people compare it to watercress and spinach, so much so that it can replace spinach in many recipes. The young and raw leaves and stems are tender and match well with salads and sandwiches. They are good also lightly steamed, or sautéed with a little extra-virgin olive oil. The high level of portulaca pectin (known to lower cholesterol) means that this plant is also useful as a thickener for soups and stews. In some cities of Italy the ancient tradition has been maintained that wants portulaca as an added ingredient for the preparation of pesto. 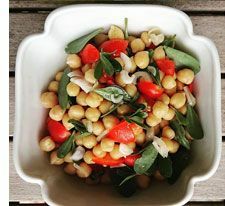 Throw basil and purslane (both the leaves and the stem) in a blender or food processor, add a small amount of extra virgin olive oil, garlic, pine nuts and enough hot water to get a good consistency. 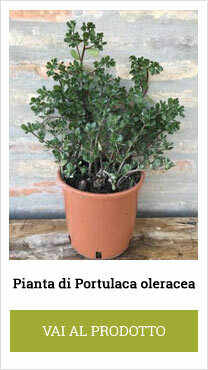 Since it is a plant rich in juices, the portulaca will help you make a good "lean" pesto without adding too much oil. A little salt (I use the integral marine of Trapani). As I have repeatedly repeated the portulaca oleracea is a wild plant that grows a bit 'everywhere, so it is not difficult to find doing a nice tour through the countryside of almost all of Italy. The problem, especially for those who live in big cities, is to find plants grown in a healthy environment , far from smog, landfills and far from fields where heavy use has been made of pesticides, insecticides and chemical fertilizers. For this reason I thought to cultivate in my farm the Portulaca oleracea , in a totally biological and natural way, without using poisons, because this is the pesticides and fertilizers commonly used in conventional agriculture. 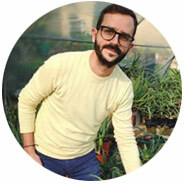 The cultivation of Portulaca takes place in the open land and in the open countryside, in the hills of San Girolamo di Fermo, far from roads, highways, landfills, commercial and industrial centers. Once grown, the portulaca plant is repotted in a 20 cm diameter pot (about 4.3 liters) and is ready to be sent to our customers. 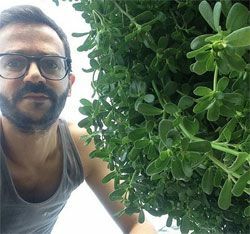 Unfortunately, the cultivation of Portulaca is limited by the seasonality of this plant, which goes from mid-May to late October, so you can buy my plants only during this period. Then the plant dies (at least superficially) and grows back the following year. The use of portulaca oleracea, as a medicinal herb and as a food is considered safe . 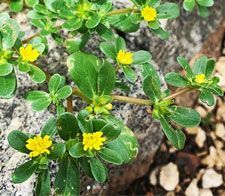 Consumption may not be recommended for pregnant women , as portulaca taken in high doses may cause uterine contractions with the risk of spontaneous abortions. If this is your case, for safety, I advise you to seek the advice of your doctor first. The only contraindication is for those suffering from kidney stones , as the portulaca can contain up to 1.7% of oxalic acid. With regard to interactions with drugs to date there are no documented interactions.